Months before producing and releasing its first full episode in 2013, STC filmed three short vignettes in May of 2012 to sort of “introduce themselves” and get their space legs. 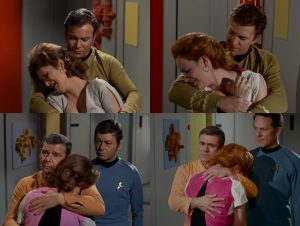 The first vignette, about four minutes long, recreated the ending of “Turnabout Intruder,” the final first-run episode of TOS to air on television. But instead of ending on the depressingly somber line from Kirk, “If only…” the vignette CONTINUED the scene, following Kirk, Spock, and Scott into the turbolift and onto the bridge. Joined a few seconds later by McCoy, the somber mood is lightened by a good-natured poke at Spock by the doctor, and then Kirk orders the Enterprise to rendezvous with the Potemkin. The music shifts to an uplifting, optimistic melody, portending new and exciting adventures into the future. The camera pans out to reveal the entire bridge crew as the credits roll. You can watch the entire vignette here and you can also watch this intriguing side-by-side comparison video showing the STC scene next to the original. This first vignette was released onto the Internet on July 31, 2012 and served to do more than simply say, “Hey, we’re here! Look what we can do!” It also introduced four of the main actors who would be starring on the series. 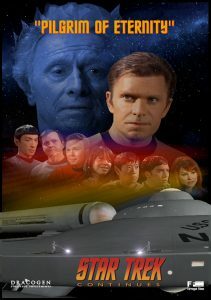 Show runner and executive producer Vic Mignogna (Kirk) was a professional actor who had done extensive voice-over work on amine and video games…along with having been a lifelong Trekkie who used to drag his mother to conventions and film his own Trek episodes on Super 8 as a child in the 1970s. Vic had worked on other Trek fan films, directing and acting in episodes of both Star Trek: New Voyages/Phase II and Starship Farragut (and later Star Trek: Renegades). And Vic decided that, as much as fans loved appearing in fan films, most of them weren’t comfortable or convincing enough in front of the camera. Real, trained actors needed to be the ones appearing on screen. Non-professional fans could help out behind the scenes, but even there, Vic wanted to have as many people with filmmaking knowledge and experience leading those efforts, as well. Fan with less experience were welcome to help, as well, but under the supervision of the “veterans.” And it paid off in having a very professional and polished look and feel to their production. Perhaps most striking, however (eerily so!) was the person playing Scotty…and with good reason! The actor portraying the Chief Engineer literally has Montgomery Scott in his blood! Chris Doohan is the son of late actor James Doohan (the original Scotty) and does an amazing job recreating that unique Scottish brogue that his father made so iconic. Chris initially came on to voice Scotty in an animated episode of Starship Farragut a few years prior, and Vic convinced him (with some effort) to come on board STC…and he’s been one of the standouts of the cast ever since. Down the line, Vic’s eventual goal was to not have to do so many jobs simultaneously and instead concentrate mostly on acting. But for what would be the first full-length episode, Vic was still the “guy in charge” and would again (co)write the story (other professional screenplay writers would assemble the final script), direct, and edit…as well as star in. But star in…what? What would be the subject of STC’s first full-length episode? Michael Forest wasn’t the only Trek veteran actor to participate in that first full episode of STC. In a bit of a coup, Vic convinced Marina Sirtis (Counselor Troi from Star Trek: The Next Generation) to provide the voice of the Enterprise computer. (To my knowledge, that made Marina the second TNG regular series actor to appear in a Trek fan film…the first being Denise “Tasha Yar” Crosby in Star Trek: New Voyages’ 2-part “Blood and Fire” four years earlier.) It seemed oddly appropriate that the person who played the daughter of Lawaxana Troi (played by the late Majel Barrett Roddenberry) would lend her voice to the Enterprise computer, which had also been voiced by Majel. Another actor of sci-fi note to appear in the episode was Jamie Bamber, who played Lee Adama (Captain Apollo…how fitting!) in the Battlestar Galactica reboot. Also worth mentioning was a cameo by Star Trek and Galactica art department veteran Doug Drexler. Doug, who had previously worked on other fan films’ 3D computer FX, had recently decided to move away from fan films. But he changed that decision in order to do CGI visual FX for STC. The 3D animations for the three vignettes had previously been done by Gabe Koerner. 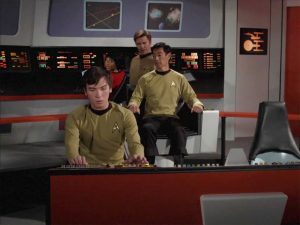 Doug also appeared on camera in the opening sequence of “Pilgrim of Eternity” in a scene which immediately grabs the viewer’s attention as being plucked straight out of the Tombstone, Arizona setting of the TOS episode “Spectre of the Gun.” It turns out the sequence is part of a virtual reality program running in a very early version of the Holodeck! The Holodeck??? Yes. 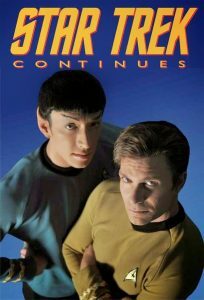 Vic and his co-writers decided to “evolve” Star Trek a little to move it forward toward things that were seen later on. It wasn’t unheard of for the original Star Trek to add new things between seasons. Chekov was added to the crew in season two…along with a new Engineering set and an expansion of Sickbay. So what might have been added in season four? Why not an early, experimental Holodeck (something already considered possible canon from the animated episode “Practical Joker”)? With Chuck Huber unavailable to play the role of Dr. McCoy, a stand-in was found in the person of Larry Nemecek. If you’ve never heard of this legend of Star Trek lore, look him up on Google (there’s 109,000 results!). He’s also served as a creative consultant to the entire STC fan series, but for its first two episodes, he played a very laudable Dr. Leonard “Bones” McCoy. 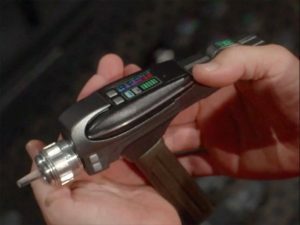 With all the pieces in place, including the amazing sets and props, costumes from Anovos, make-up artists, lighting specialists, sound people, production crew of all shapes and sizes and specialties, and of course, the actors, filming began in October of 2012 and lasted a little over a week. Yes, I said week…just like an episode of the original Trek did back in the 60s. Fan reaction was overwhelmingly positive. Sure, there were complaints that Vic Mignogna’s acting was too derivative of Shatner or that this or that actor could never replace the original…and, well, of course! No one was trying to replace anyone, only to honor them by carrying forward their iconic characters. But despite a few grumblers out there, the vast majority of fans were blown away by what they saw (including me! ), and were eagerly anticipating what would come next. Vic reportedly spent about $40-60,000 of his own money financing the first full-length episode. Vic also commented in a recent interview, “My feeling was that it would be unethical for me to ask people to give me money to do something I had not proven I could do.” And even though the three vignettes had grabbed people’s attention, they totaled less than ten minutes of actual episode time and likely wouldn’t inspire as much funding support as a full-length episode would. Indeed, that seemed to be the case with other early Kickstarter crowdfunding campaigns for Trek fan films. The earliest Trek Kickstarters in 2012 mostly failed to reach their goals, as none had produced anything significant to show before asking for money. Only Star Trek: Renegades had anything of substance to show fans when they did their Kickstarter in 2012, as Renegades was being made by the same folks who released the 90-minute Star Trek: Of Gods and Men back in 2007-2008. But that was enough to show they knew what they were doing, and Renegades raised $242,000 from 2,376 donors. 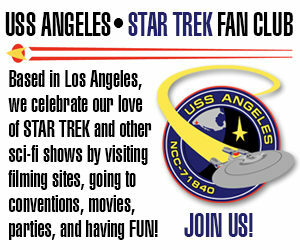 Star Trek Conitnues raised about half that ($126,000) but from more donors (nearly 3,000). Since STC had set a goal of $100,000 and surpassed it, STC got to keep what they’d raised. (Kickstarter doesn’t allow campaigns that fail to reach their goal keep the money money raised). According to STC’s campaign info page, $100,000 would allow them to film three additional episodes, and that’s just what they did…! Next time: our spotlight on Star Trek Continues concludes with a look at their remaining four episodes (so far) and how they continued to push the envelope ever farther. STC’s make-up and costuming departments get taken to their limits, and STC holds another Kickstarter giving fans a piece of the action. Then they venture outside of the studio for STC’s first-ever on-location shoot…and what a shoot it is! And finally, we’ll ponder along with Vic what the future might hold for this MUST-SEE fan film series. Watch “Pilgrim of Eternity” by clicking here. Watch “Lolani” by clicking here. Watch “Fairest of Them All” by clicking here. Watch “The White Iris” by clicking here. Watch “Divided We Fall” by clicking here. Watch “Come Not Between the Dragons” by clicking here. Watch “Embracing the Winds” by clicking here. Watch “Still Treads the Shadow” by clicking here.